The grandest theatres in Prague stage opera and classical concerts, however black light and puppet theatre offers audiences a more Czech experience. Shows mix cutting edge visual and audio effects with dramatic dance, mime and acrobatics. Below is our guide. You can also view theatre listings & book tickets. Black light theatre is a specialty of Prague. It is a world of illusory creations and hidden secrets, with the story related visually through a highly charged mix of theatrical elements. While every black light show is different, each includes many of the following: dynamic dance routines, colourfully dressed mime artists, ballet, singers, puppets, animated film, state-of-the-art visual effects and dramatic sounds. There is a strong emotional edge to performances, with comedic touches. Shows are suitable for adults and children of all ages. Ta Fantastika | Image Theatre | All Colours Theatre | Srnec Theatre | Metro Theatre. Listings and tickets: Prague theatre tickets. Puppet theatre enjoys a long tradition in Prague. A master puppeteers' creations are true gems of artistic craftsmanship. The National Marionette Theatre is the original puppet theatre, and by far the best of its kind in Prague (avoid the imitators with similar names). 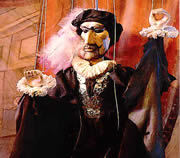 Its puppet shows feature life-size puppets dressed in period costume performing marionette versions of Mozart's Don Giovanni and the Magic Flute. The theatre uses authentic 18th century stage sets. Laterna magika is a variation of black light theatre. The shows employ many of the same theatrical elements (see above), but with a greater emphasis on film and computer generated visual effects. The productions are vibrant and fast moving, often with an emotional edge. Laterna magika shows are staged at the New Stage Theatre in Prague, which was established in 1958 as the world's first multimedia theatre. Shows are suitable for adults and children over 10 years.